I started doing a good amount of single leg cycling in an effort to develop some better coordination and strength in some muscles that were shown to be weak or not contributing to my pedal stroke until too late. Before starting I did an assessment for each leg to figure out at what level of resistance I could maintain a semi fluid pedal stroke while stressing weak areas. At that resistance my HR is relatively low (approx 50-60% max HR), and my RR is also pretty low. So far I'm happy with the resistance level, my interval durations, etc. It seems to be working my hips, hamstrings, etc, but not so much my RF or VL. Since I am only pedaling with one leg and my delivery is much higher than utilization - the SMO2 levels do not fluctuate that much, and the THB levels grow during the interval (and do not show the drop and rise after). I may need to place the sensor on a different spot like my hip, hamstring, or glute - the RF might not be the best place. My question is that in an instance where you are stressing one leg at a time, or one arm - you are likely not going to see the high desaturation levels or really low SM02 levels correct? But that doesn't mean you aren't accomplishing your goal right? Cause maybe I'm not performing "hypertrophy" training (I'm not looking for giant useless muscles), but if my delivery is higher than utilization and my legs are saturated - this should lead to greater utilization, cappilary density, etc.... THUS.... increasing the capacity of my muscles to generate power, just not making them larger. 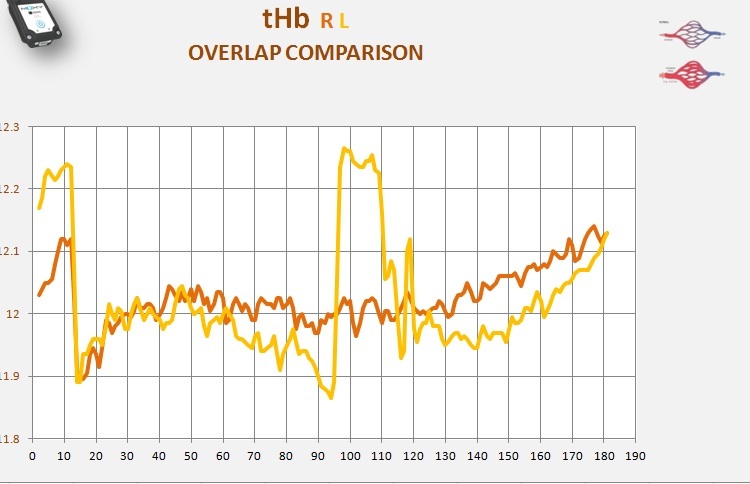 I'm trying to get a better understanding of stressing limiters while not stressing other areas, and so far I've been pleased with my ability to work each leg individually really well without raising my HR and RR very high. Just want to make sure I'm on the right track. It depends. There are many variables. Quickly. If you are trying to engage muscles more evenly (perhaps put better: trying to develop a constant power output throughout the spin) then it is hard to desaturate the RF the same as when you are not trying to accomplish this. You are essentially stressing the RF less in order to balance out the pedal stroke. If you are simply riding hard, with no regard to how constant the power is throughout the cycle, then most definitely you can bring down the SmO2. Way down. It may take a while for you to get there but it can be done. I can dig out some files if there is interest. Have you given any thought to your setup? On what sort of "bike" are you conducting this workout? Is there a flywheel? How might the setup be influencing the training stimulus? Etc. Single leg cycling came up in the respiration as a limiter thread (you might want to have a look at that thread if not done already). Based on that thread i did a quick experiment - sensor on the right RF. As you can see this did cause significant desaturation in RF muscle (and i could feel that hamstrings, glutes and other muscles were fully engaged than in a normal pedal stroke too so if i had a sensor on those i would have expected to see them desaturate too. Use a setup that has a big flywheel or put a 10 pound weight on the unused pedal. For example , use a spin bike. Then select resistance so that the going is hard around 60 RPM. 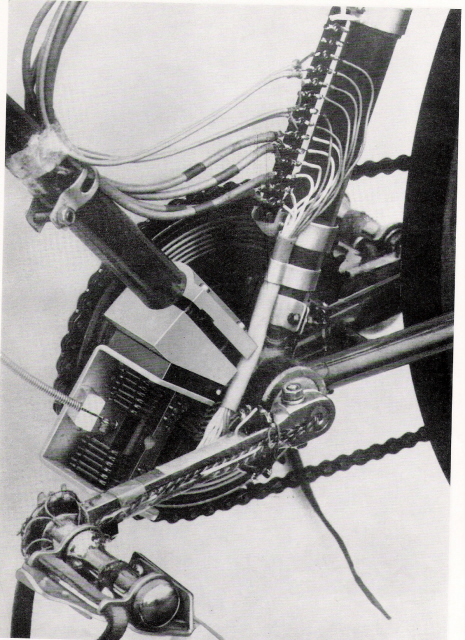 Or try independent pedals like smart cranks or power cranks on a normal outside bike so real biking on a road with a power mete and the power meter is as well left and right independent. Thank you for following up on my original question. I did see the discussion in the other thread and was following along closely. My focus during my single leg workouts so far as been to focus on a smooth pedal stroke (as much as possible). I have been placing the sensor on my rectus femoris. This is a workout from today. I did 2 - 5 minute warmup efforts with both legs, then did 5 - 2 minute efforts with my right leg, then 5 - 2 minute efforts with the left leg. I moved the sensor from one leg to the other to get data from both. All recovery intervals were 1 minute, seated position with hands on bars with my sensor leg down at 6 o'clock position. The non involved leg was positioned on a box. It makes sense that the left leg efforts feel much more difficult to complete. The desaturation is more dramatic. 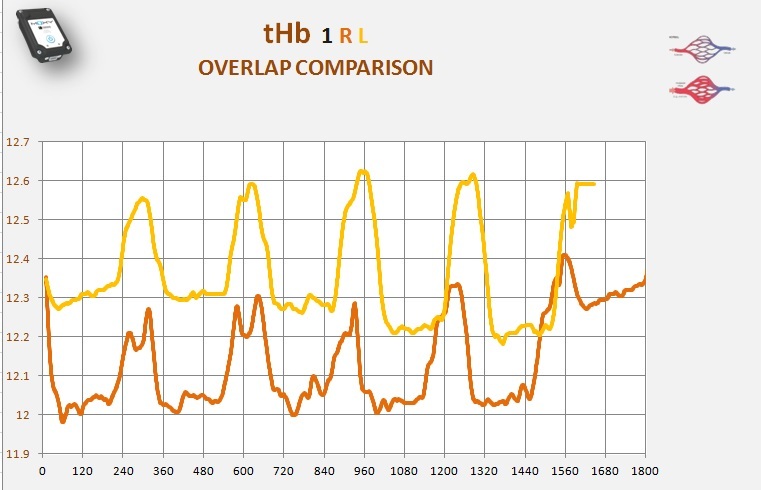 The THB levels are dramatically different between left and right. Not sure what that means, but I will start looking into it. I have never done much single leg cycling in the past with training but I'm excited about it now and have made it a large part of my weekday training schedule. Keeping my HR and RR low while working weak parts of my legs also seems to be a benefit. Side Note: my workouts are being done on a Wahoo Kickr training which has a fairly large flywheel. That I'm sure attributes to the initial drop in SMO2 and THB levels when the effort begins. 1. If we have one single MOXY and compare , the first article point is to never trust what we see due to possible placement differences. So after you did 100 plus of this shifts and you have hundred time the same or similar trends you can be somewhat more confident that it is you and not the placement you did. Nevertheless we have some indication where we can look at the trends rather than the absolute values. When we talk trends we can look at amplitudes of tHb and SmO2 and so on. The second part is we can take like in your case HT as an additional indication whether we had a higher support or needed a higher support of CO over at least HR as we know . So here the overlap of SmO2 first. Now like in SEMG , if we do not have the load from left and right than we have to be careful with the conclusion. If we know we pushed +- the same load than it is easier. As a side note - The output by me varied as I think the more uneven pedal stroke created by the single leg cycling interferes with the way the trainer applies or senses the resistance. This causes a variation between the load applied by the trainer and my output. Typically with two leg cycling workouts the values are almost identical. Thats a discussion for a wahoo forum and not a moxy forum though. I am going to look through some forum posts and try and learn more about what the bias charts mean. Also - excellent point in noting the lack of historical data/trends for me. Consistent placement of the sensor is definitely a big part of this I'm sure. That is a great feedback and we can +- go from the information that the power out put is pretty close to the same in both legs. 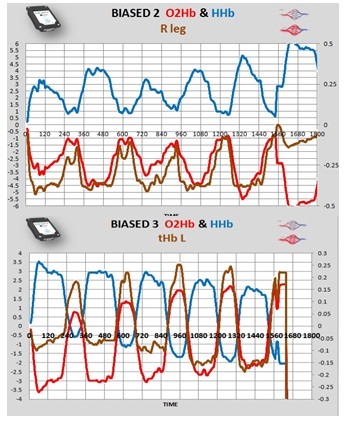 I will show some data's where we had different outputs and you can see that in he NIRS feedback. Some interesting key points in your data. Look at recovery in the biased versions. Than look at tHb amplitude and think what that could indicate. remember that whine we used SEMG and NIRS the tHb had in many cases a direct link to the motor unit recruitment from the SEMG feedback. Now the next few times you repeat your workouts we can compare the trends but than apply a MOXY on the contralateral arm and see on whch side we have a bigger involvement of the upper body to keep the legs going . Use the muscle chain from left leg to right arm from cycling. If you do no know how it works ask a cycling coach or perhaps we have form the many cycling coaches a feedback on here. There is a very distinct muscle pattern as well in cycling as a contra lateral activation so right leg left arm and it has t go through the center of gravity so over core stability. Here the data and we may find some time to look at this closer. The above graphs seem to be tips to help with my other post, so thank you. Question to my graphs but first to your answer. Move form the dishwasher to the cook stove you are ore than ready. Can you see now where you could have ,depending on the goal you stop the workout.? Can you see that SmO2 is not optimal without looking at delivery or in this case not delivery. 1.which is the " stronger " or better trained leg . To confirm this we would benefit from power, but in the average person what do we expect will be used to compensate for a weaker leg. ? 2. Now in this case we do not see the after calibration, as this would help to see, whether we have a left and right leg occlusion trend. 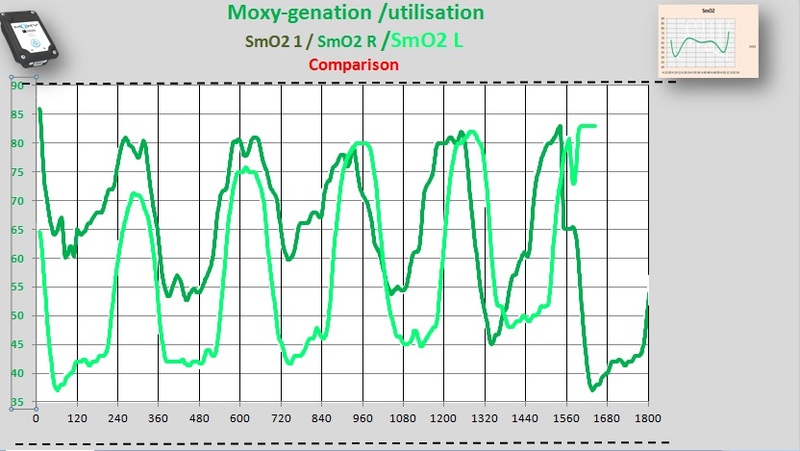 Now in this case we have VO2 data. CO2 and O2 trends and therefor the RER ( some still believe a VO2 equipment can test for RQ !!!! ) So no or reduce flow back to the right ventricle and therefor to the lungs . But it is still in the body so the unseen real with NIRS but the unreal seen in the mask . So the interpretation may be ??????? Will go back to that if there is interest. 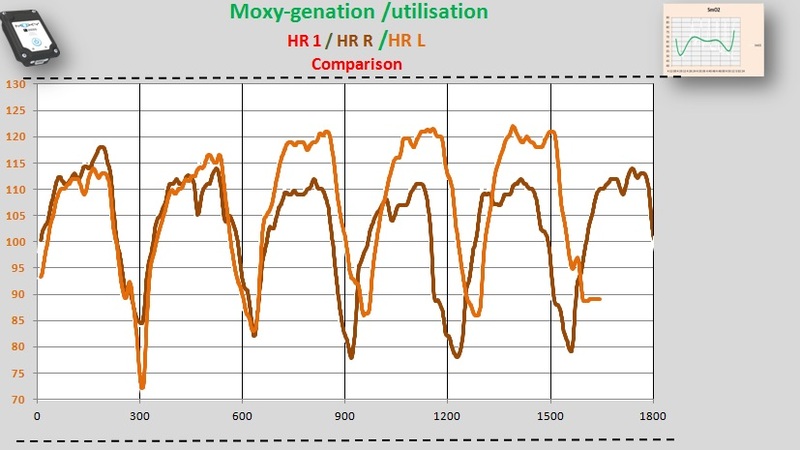 What does VO2 data will tell us in this situation. ? Can you see now where you could have ,depending on the goal you stop the workout.? It looks like I could have stopped after the 3rd effort of my left leg. The right leg efforts all seemed to rebound/overcompensate. I want to say the right leg... but that is just based on the spike in the THB on the left. The fact that the right leg desaturates more could just mean an over use of the muscle the sensor is located. Now here a dangerous cook book. In many cases when you eat the left and right leg assessment with 2 moxy and you have despite some slightly different placement always the same side in this case the right side with a lower SmO2 ( indicating a potential higher O2 use ) and you always see a higher tHb, indicating a higher blood flow as blood may go where it s most needed . than we have often a sronger leg in front of us. I have hundreds of cases like that after ACL ops or THR or TKR. So this than can be used for workouts. So this patients have tuna left and right MOXY . Warm up wit simple feeling and see by what intensity they simply make the easier choice and either push more , because it just happens or avoid pushing more on the operated side due to discomfort. Now they can keep both legs on the pedals and simply follow live the attempt to integrate the operated leg more into he motions , whether it is both legs squatting or cross country or stepper or walking or biking. If the power would be even and controlled , than we have to look at some additional option. 1. If all is equal than the weaker leg will desaturate more , but it as well will have a lower tHb due to the muscle compression. ( this in contrast to the stronger leg which desaturates more but often tHb is up due to the higher delivery of blood to this more optimal trained leg. As we push more n the good side and less or at least not more on the other side we have often this situation that as long the CO is strong enough to see this tHB reaction which is very fascinating how nature works. 2. but always keep in mind .Remember the VL drops to low and than flat and the late integration of RF ) that a less drop in SmO2 could be as well a intermuscular shift. We see this nicely in ACL operation post ops. 1. if they have a hamstrings graft than we see that by a certain load they push more with quadriceps as the hamstrings may start to get uncomfortable. 2. versus if they had an operation based on a patellar tendon graft, where they integrate the hamstrings more as the push is now uncomfortable from the patellar graft. Or in THR when they had an anterior intake for the hip replacement versus a posterior or postero lateral intake . Than we see the difference in pull or push as apart . Now in athletes if they have a difference left and right and they always push hard the difference will get rose no better. 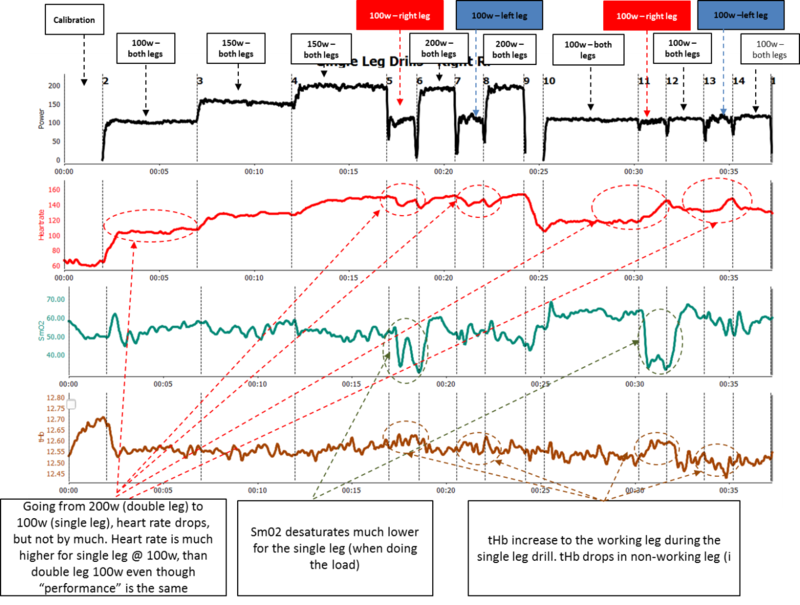 Now you can imagine if we use NIRS on one muscle and based on the SmO2 trend ( looking for a break point and not even taking tHb into consideration ) and than we mystically find a mathematical formula and base the training on this findings and it was the weaker leg or stronger leg , than you can imagine what that means and the connection with lactate and NIRS has pretty little to do with a training zoning idea at all. I would consider my assessment to be controlled since it was performed on a Wahoo Kickr with the resistance set the same for both legs and all intervals. 1. If all is equal than the weaker leg will desaturate more , but it as well will have a lower tHb due to the muscle compression. 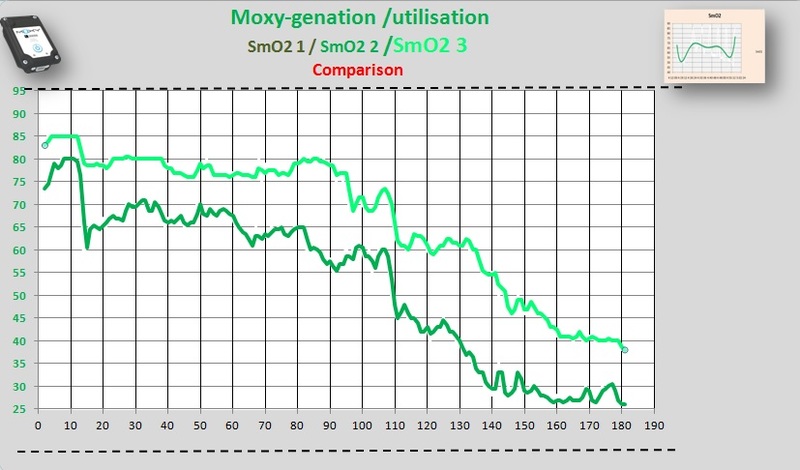 As you pointed out before, with only having one Moxy I should do a few more assessments and see if the trend is consistent. I will be doing plenty of single leg workouts so I should get the data required. My strength training workout the other night showed my left leg desaturating less than my right but with more THB... this is definitely a puzzle but fun to learn. Edit - Was thinking about this on my drive home and was disappointed I didn't ask or point out - taking into account everything mentioned above - why is my heart rate higher for the left leg efforts if it is the stronger leg? Also, couldn't higher THB levels also show a occlusion, or a greater occlusion? I went back and looked at my file and didn't see a super defined trend after the load ended but there was a dip and then recover for the last one or two on the right leg, and 3 out of the 5 for the left.